Two hated rivals, both slumping teams, met at the Garden for their 4th encounter this season on Saturday night. 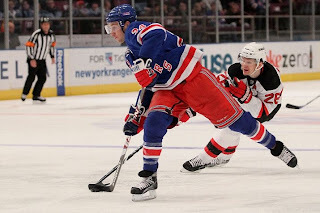 Both the Rangers and New Jersey Devils have been offensively challenged and last week both sought some scoring punch with major trades. The Blueshirts obtained Olli Jokkinen from the Flames while the Devils grabbed Ilya Kolvachuk from the Thrashers. Tonight would be their first game against each other as they would sample one of the more compelling rivalries in the East. This game represented an opportunity for the Rangers to snap two negative streaks. So far, the home team had lost the first 3 games between the 2 teams. Henrik Lundqvist had lost his last 6 decisions in a row, the longest losing streak of his career, including the most recent loss, a demoralizing 6-5 loss to the Capitals on Thursday night. Meanwhile, the Devils came into the game on the heels of a stunning reversal from the previous night when they scored 3 times in the last 2:32 of the game to turn a 3-1 deficit to the Maple Leafs into a regulation victory. But when the final horn sounded at the World's Most Famous Arena, once again Henrik Lundqvist had outdueled Martin Brodeur to lead the Rangers to a much-needed 3-1 victory. The official recap, well worth reading, is here. everyone know he had to come to play. The Devils controlled nearly the entire first period as they cycled freely in the Rangers end and showed their patented passing that led to numerous opportunities. They outshot the Rangers 10-7 and had 2 power play opportunities. Early on, Brandon Prust engaged Andrew Peters in 2 fights to break up the Devils' momentum. Neither fight was entertaining but they did serve to slow down play. The Rangers only had a couple of quality scoring chances including a two-on-one that ended up with Sean Avery coming down the left side only to pull a Chris Higgins by launching the puck a mile wide of the net. Henrik was sharp from the outset and his glove hand was especially so. He stole a deflection that Kovalchuk tried to put in at the right doorstep. In fact the Devils apparently decided to shoot glove side often but they were denied all night long. One problem may have been that none of those shots were higher than Henrik's elbow so he was able to snag all of them without worrying about shots going over his shoulder. The 2nd period started out the same with the Devils controlling play and they were rewarded with 2 early minor penalties in the first 4 minutes. In fact, they had a short 5-on-3 advantage but the Rangers stubbornly refused to give ground. "backbreaking" for something positive for the Rangers. Then the game changed dramatically over the course of the next 4 minutes. Rob Niedermayer, within 40 seconds of the expiration of the Devils power play, was whistled off for hooking Eric Christensen. A little more than a minute later, Marian Gaborik padded his league leading power play total by tapping in a beautiful cross slot pass from Ryan Callahan behind a helpless Brodeur. The Rangers' success, a direct result of some pretty passing, on the power play picked up from the Capitals game. The success also served to deflate the Devils and energise the Rangers for the next couple of minutes. 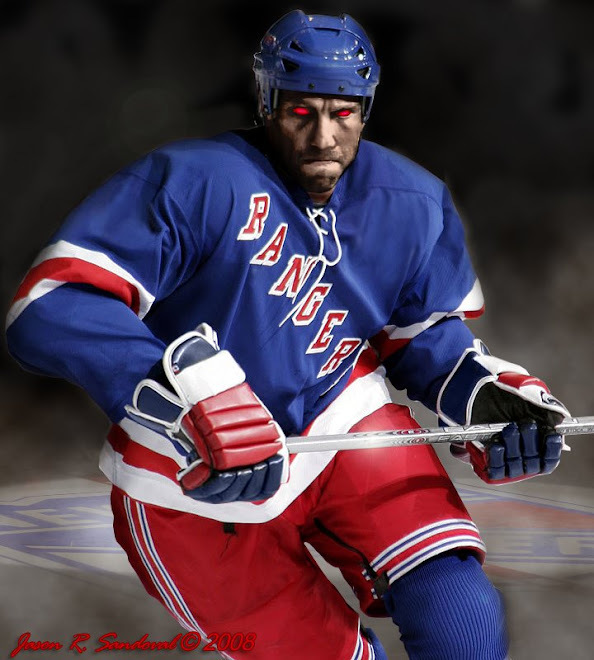 after his steal and shot gives the Rangers a 2-0 lead. Within a minute later, Ryan Callahan stole the puck off Mike Mottau's stick inside the Devils' blue line and launched a shot that beat Brodeur for a 2-0 lead. Within 2 minutes, the Rangers again mounted an attack led by Bradon Prust and Matt Gilroy who combined to find Chris Drury between the circles where he beat Brodeur for a lightning quick 3-0 lead. Despite being outplayed and outshot for 2 periods, the Rangers had bunched together 3 goals within 2:40 to take what would become an insurmountable lead. 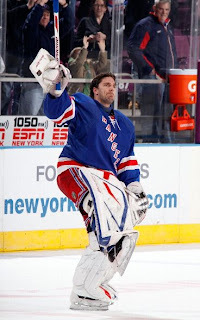 At the conclusion of the 2nd period, Henrik had shutout the Devils at the Garden for 105 minutes and counting. 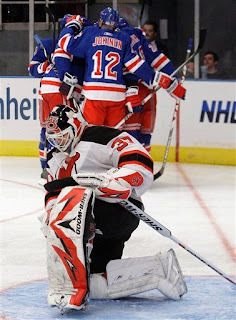 After two periods, although outscored, the Devils had outshot the Rangers 22-17. That was a prelude to the onslaught of 20 shots they would fire at Henrik during the final 20 minutes, which itself was surprising given that the Devils had played the night before in an exhilarating battle with Toronto. But the Devils energy did not flag. The Rangers scrambled to cover but they used their bodies effectively at times so that Henrik would have clear views of the shooters. On some occasions, was high in the box to cut down angles and aggressively go after shots. It appeared that he changed his game to break his recent losing streak. Also, as others have pointed out, besides having a new glove, which Henrik says is better for catching the puck than simply blocking it, he also has kept his glove hand up a bit higher recently. Finally, with under 9 minutes to go, Zubrus broke the shutout but that was the only goal they would score. One of the keys to the Rangers' ability to thwart the Devils was the simple fact that the Rangers took no penalties in the third period that put them a man down. This was a big difference from the 9 minors they took against Washington. Henrik made several more key saves including a nifty across-the-crease glove save against Mike Mottau to prevent the Devils from getting within one goal late in the game. With 3 minutes to go, at a pivotal point, Sean Avery antagonized Kovalchuk to the point that both ended up taking double minors which took them off the ice for the remainder of the game. Avery, other than missing on a 2-on-1 opportunity, had a good game. The presence of Prust and Avery have given the Rangers a bit more snarl and Avery has been using Prust's presence to be more physical. Apparently, the refs are having a hard time deciding who they want to penalize more. Well-deserved bow after 41 saves. at the Garden during 125 minutes of play. His career record against NJ is 17-6-5. .
As for the recent scorer acquisitions, both Jokkinen and Kovalchuk made their presence felt even though neither scored. Ilya had 8 shots on goal and showed a physical presence that you can see will help the Devils once he settles in. Olli had 3 shots but also showed some strength with the puck and did a good job winning faceoffs -- 2 skills that the finesse-laden Blueshirts need. In case you have not been watching the standings, there is an interesting disparity occurring as the top teams in the Eastern Conference are distancing themselves. Washington is on a 13 game winning streak. NJ, Pitt, Ottawa and Buffalo (despite losing their last 4) have put some serious distance between themselves and the rest of the conference. The Canadiens have become hot and moved past the Rangers. The Bruins and Isles have been in worse tailspins than the Rangers. The only reason the Rangers are still in the playoff hunt is the fact that several teams went into huge slumps. Still, they are 9th but Philly, the team ahead of them, has 3 games at hand and Atlanta, right behind, has 2 games at hand. Without a significant winning streak like the ones the Rangers put together the past 3 seasons, they are nowhere a shoo-in to make the playoffs. Personally, as I have said here, the Rangers are not a playoff threat, at best a contender to get in. Unless Glen Sather can pull out some more rabbits out of the hat in trades, this team will remain a 7th or 8th seed at best and a likely candidate for a quick exit this spring. Compared to the past playoff years when they took Buffalo to 6 games in the second round and Pittsburgh to 5 games the following year, this season does not constitute progress in terms of competitiveness. However, on the bright side, the Rangers have gotten younger and have put together some scoring lines that need the rest of the season to gel. There remains purging to be done (and we know all the names) and let's hope that the next GM (I can remain optimistic, can't I?) will show more restraint when armed with the MSG checkbook and avoid useless signings like Brashear and others who are past their prime. Matt Carkner, the bully who mercilessly beat up Vancouver's Tanner Glass the other night, about to get a beating from a real fighter who is cheaper and more skilled than the worthless Donald Brashear. 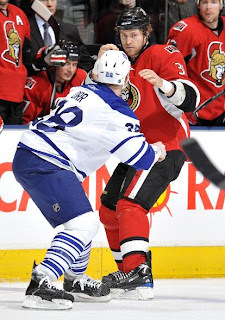 Speaking of the oft-scratched pugilist, recently two Colton Orr highlights have appeared on the net from his play during the past week or so (e.g., his breakway goal against Brodeur and his TKO of Matt Carkner of Ottawa on Saturday night during Hockey Night in Canada). Orr has more points and more highlights than Brashear. I cannot help but continue to wonder how much hockey sense Tortorella actually has since he insisted on bringing Brashear and getting rid of Betts (to be replaced on the 4th line by the overpaid captain who cannot win faceoffs) and why MSG ought to get rid of both no later than the end of the season. One more for Marty? Damn..you're right. Thanks anonymous. Holyyy Shi...Jagr receives NHL reminder. But We Scored Five Goals!!?? Instant offense? The Joks on you!